Maeroa Intermediate has a well resourced E-Learning Infrastructure. We have school wide wireless network, allowing free access anywhere, enabling students to work in a variety of environments. Our network is administered professionally, and we have a forward thinking group from the BOT and Staff that believe in the importance of Digital Technologies for lifelong learning. Each classroom has at least 12 devices, this includes a mixture of Chromebooks, Ipads, Desktops, Netbooks and Surface Tablets. This enables teachers to consistently use devices and online resources as a tool across all curriculum programmes. It also supports our philosophy of equal access to and opportunity to use digital technologies for every student at Maeroa Intermediate. Students have their own personal username and password, which allows them access to email, the Internet and a range of communication resources, upon signing an acceptable user policy. 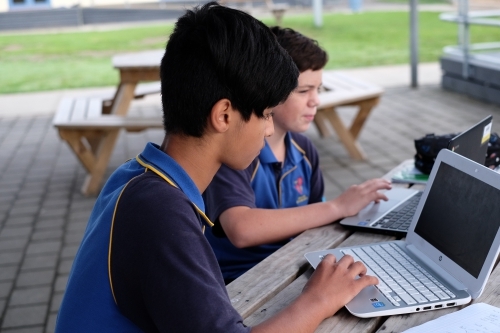 Maeroa Intermediate uses Google Apps for Education to facilitate students learning. E-Learning is central to the 21st century learner, through connectivity, communication, interaction and presentation. We are innovative in our approach to using these digital technologies to fulfill the vision for learning that we have at Maeroa. Through the use of the Internet and communication tools we are able to make available for students, resources, software, hardware and online sources, that enable successful outcomes.